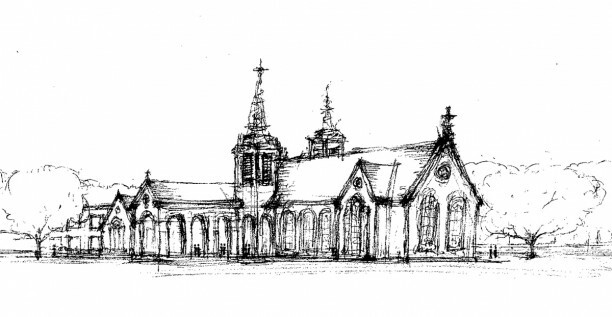 Carraway and Associates was selected by St. Martin’s Episcopal Church in Houston, Texas, one of the largest Episcopal churches in the country, to provide master planning and design development for a new church building, new parish hall, new kitchen facilities, cloister, gardening space, and entry. The scope of work also comprised a remodeling of existing facilities to accommodate a new chapel and upgraded education spaces. The master plan required the relocation of an existing road and extensive site studies for the inclusion of sufficient parking with little disruption to the existing green space. These studies can best be seen in the comparison of “Existing Site Plan” and “Proposed Master Site Plan”. Part of this work was studied and presented with the construction of a model as represented in the photos.